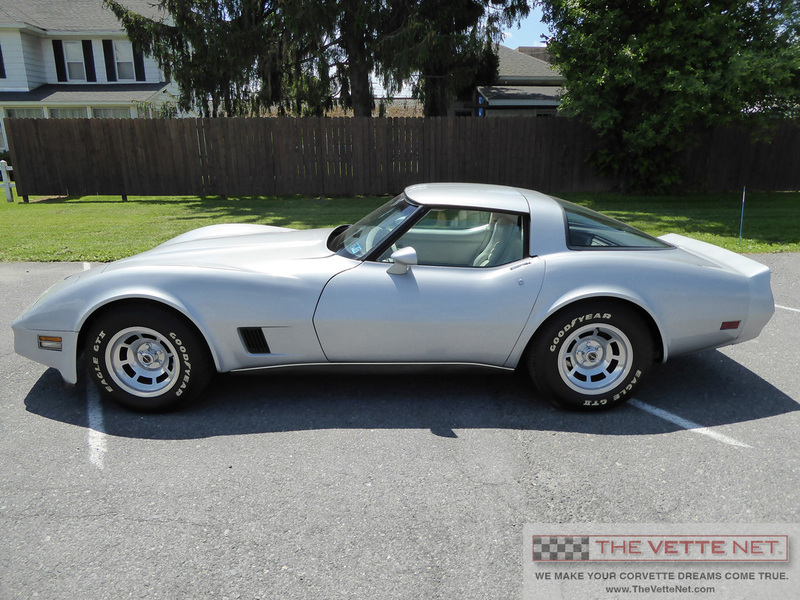 GENERAL INFORMATION: This Award Winning Top Flight 1980 Corvette T-top is privately owned and located in PENNSYLVANIA. It is our pleasure to present to you this original Silver and Oyster example showing just 46,042 miles on the odometer. Being a “Top Flight Award” recipient, this beautiful 1980 Corvette has been judged factory original and has all the factory correct components. Today you have this rare opportunity to be the next proud owner of a very special 1980 Corvette that has never been restored. SPECIFICATIONS/OPTIONS as reported by the owner: This Corvette comes with numerous important original documents. You will see the order sheet lists many nice options including: Automatic transmission. The L48 engine (350c.i. rated at 190hp). Factory air conditioning (blows cold). Power steering. Power brakes. Power windows. Power door locks. Power antenna. AM/FM stereo radio with cassette player. Rear speakers. Cruise control. Rear window defogger. Heavy-duty battery. The rear axle ratio is 3.07 and perfect for taking long trips. The Good Year Raised White Letter Radial Tires have lots of tread life remaining. CONDITION: The owner rates the overall cosmetic condition of his Corvette as exceptionally nice especially considering its original condition. The undercarriage is very clean and reflects the few miles this Corvette has been driven since new. All the maintenance has been done and this Corvette is ready for you to enjoy. DO YOU HAVE A CORVETTE TO SELL? Would you like to reach a worldwide market of prospective buyers at no cost to you? Visit www.TheVetteNet.com and view the "List With Us" page. Respond to the data requested and I will personally follow up with you. Thank you!